Hi all! It is nearly Christmas. Woo! One of my favorite things about the season is Christmas dinner which is undoubtedly the best of the year. Anybody who knows me knows that I love food and as well as eating it, I could talk about it all day. That is why when I found this old post I wrote during my time at the ICD, I thought I would rehash it here. It is about Slovenian cuisine which may seem a bit boring but often learning about food can help you to learn more about another culture so I hope you enjoy this and maybe pick up some information that might win you a pub quiz one day. While food is a want and need in a lot of today’s world, for many people it is also a love. For those lucky to be able to enjoy food as a luxury, globalization has allowed for a vast variety of food to be on offer worldwide. People do not limit themselves to a single cuisine and whether you live in New York City or a mountainous town in Switzerland, you can be sure to find many multi-cultural food options at the palm of your hand. Considering that food is a universal love, for many travelers cuisine is a main source of enjoyment on trips abroad. Therefore, people enjoy travelling to Italy for the pasta, France for the cheese and wine, Mexico for the tacos, and wherever else may offer such culinary delights. The destinations named here are perhaps the most popular examples of desired food. However, there are many underestimated or perhaps even undiscovered gastronomic pleasures available to the world. Slovenia is one such place and is certainly is a potential travel destination for food lovers anywhere. Perhaps the most special thing about Slovenian cuisine is its diversity. Slovenia offers no single, distinct type of cooking. In fact, some experts have suggested there are forty different distinct types of Slovenian cuisine. Such a scale range and diversity is comparable to much larger countries. Four of the major influences in Slovenian cuisine come from its bordering countries; Italy, Austria, Croatia and Hungary. Strong influence from Italy is seen in the numerous pastas and pasties available. Strudel was adopted from Austria, and many pork and beef dishes have a traditionally Hungarian background. Slovenian cuisine diversifies itself again as it is also heavily influenced by the country’s seven different regions. There is a further distinction made again within these regions as dishes can differ from town, farmhouse, castle, etc. Slovenian cuisine has changed throughout the years. Traditional aspects to the dishes have been maintained, but changes have also occurred allowing the food to continually adopt and develop. One example of this is the transition to healthier dishes. Slovenian cuisine is traditionally hard to digest. This is mostly due to the choice of ingredients which have high calorie content, such as, animal fat, lard, butter and eggs. The high fat content in such foods were not of importance to the Slovenian people as the work they carried out was hard manual work, allowing them to burn these calories efficiently. Therefore, Slovenian food today is following the lead of the rest of the world with healthier choices being implemented. Slovenians are also continuing to adopt dish styles which are already popular around the world and implementing them into their cooking. While there has always been culinary delights such stews and porridge, soup is a relatively new epicurean delight, only becoming a common dish in recent years. 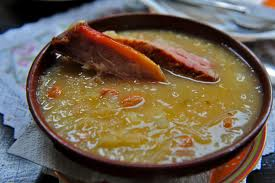 Slovenia now offers over one hundred types of soups although meat based soups are only served on Sundays and feast holidays. The old Slovenian proverb says ‘love comes through the stomach’. Certainly, as you as a tourist and a food lover begin to enjoy Slovenian cuisine, it will become apparent just how true these words are.